Friday Night’s Tornadoes Kill 12, Injures More Than 100 Visit http://UJAdonations.com/OKC to donate. By Daniel Horowitz--For over a week, a team of dedicated and professional IsraAID workers have been on the ground in three Oklahoma towns, helping citizens devastated by the recent tornados that have leveled much of the area. Less than two weeks after a monster twister ripped through the city of Moore, the death toll from tornadoes that struck Oklahoma and neighbouring states this weekend has jumped to 12, authorities said on Sunday. Twelve people were killed and 104 were injured, in Friday night's tornadoes and the resultant flash floods. This evening, the IsraAID team, whose efforts in Oklahoma are being supported by funds raised through the UJA of Greater Toronto Oklahoma City Tornado Relief Fund, will be running a volunteer-training program for the local Jewish community who will then join with IsraAID tomorrow to help with the organization’s work in Moore. "I think all in all, everyone - from the Jewish community to the Christian groups to the Israel consul general to the community-at-large, are please to know that IsraAID is here, helping them in this difficult time", said the executive Director of IsraAID, Shachar Zahavi. "I hope to send an additional team to the Oklahoma area next week and, if all works as planned, we will remain there, on the ground, for another month." 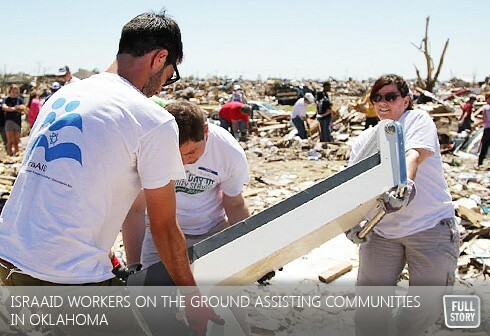 Yesterday, along with 75 volunteers from Oklahoma City’s Jewish community, and the Jewish Federation of Oklahoma, members of IsraAID were hard at work helping to clear debris in Moore, Oklahoma, the hardest hit part of the state. "IsraAID will continue its efforts on the ground working along side our Jewish and Christian partners," assured Zahavi. UJA Federation of Greater Toronto has partnered with IsraAID since the Southeast Tsunami of Boxing Day 2005.